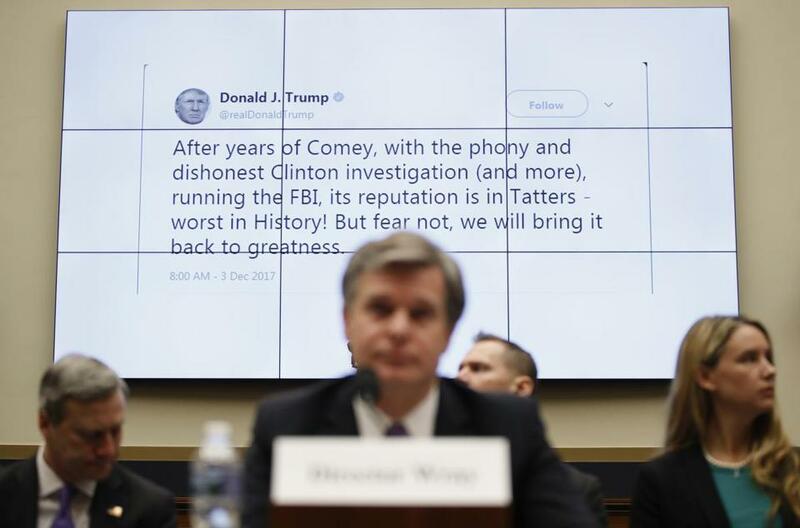 A tweet by President Trump was displayed behind FBI Director Christopher Wray during a House Judiciary hearing on Dec. 7, 2017. One crucial distinction in English is the difference between a proper and a common noun. “Boston” is capitalized, but not “city.” “Donald” gets an uppercase letter, while “golf” is lowercase. The language didn’t always follow such rules. Two centuries ago, use of the upper case in English was as rampant as it was arbitrary — read through the King James Bible or the Declaration of Independence. Written English looked more like German. Over time, standardization quashed the capitalization of English common nouns. But the Wild West of social media has resuscitated this old practice, at least in certain quarters. Today, a phenomenon dubbed “random mid-sentence capitalization” has become widespread. It is now clear that these seemingly random or unimportant aspects of language are markers of ideology. Let’s take two recent tweets, the first by President Trump and the second by Iowa Republican Representative Steve King. 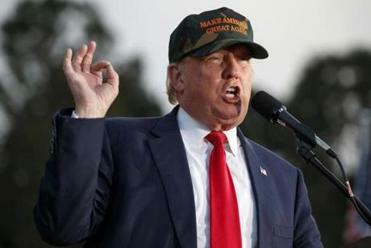 The president writes that the reputation of the FBI “is in Tatters — worst in History!” King, meanwhile, states that “Illegals have No Right to be here & have ALL violated our laws.” In both instances, the capitalization may have been all wrong, but the sentiment was right on-message. Unnecessary capitals aren’t just a way to emphasize particular words or phrases. They’ve become overtly political acts. Gratuitous uppercasing is a way to set the agenda and frame the debate. Viral hashtags like #MeToo may be trendy, but they’re not the only way to command attention. Trump stinks at Twitter. Sad! A successful social media strategy includes two-way conversations, something almost entirely absent from Trump’s feed. Read: Trump’s signature is ‘horrifying,’ but should you care? Linguistic analyses of Twitter can complement the vital work that computer scientists are currently undertaking to understand how bots use the platform to spread propaganda and sow discord. Last year, Rachael Tatman, a sociolinguist at the University of Washington, performed a computational analysis of the Twitter feeds of users with either #MAGA (“make America great again) or #theresistance in their Twitter bios. Tatman found that #MAGA users employed significantly more capital letters than their #resistance counterparts, in statistically robust ways. These choices weren’t arbitrary; there was an observable pattern in this behavior. Tatman’s research indicates that conservative politicians and citizens are apt to deploy capital letters in tweets as a rhetorical device. There is nothing inherently wrong with capitalizing words that are usually lowercase. If this is how conservative users wish to use Twitter, that is their prerogative. The Tea Party phenomenon, critics have noted, was rife with enthusiastic over capitalization. The critical task is to understand why nonstandard capitalization is occurring, and what purposes this serves. We should not attempt to tarnish such usage preemptively, which is a task we would fail at anyway. Languages are always evolving. So even though the difference between proper and common nouns is the stuff of high school English, this does not mean that these distinctions are immutable or based on natural law. Perhaps there is a much simpler explanation for all this rampant capitalization. After all, a tweet cannot use bold or italic text; the palette available to all the world’s tweeters is famously spare. In such a spartan environment, how else can a digital communicator make a statement except by throwing around Some Capitals? Still, if this were truly the case, people across the political spectrum would deploy capitals on Twitter at the same rate. It seems more likely that variant Twitter use represents just the latest front in the struggle for political power — and that the nation’s ideological divide now extends to capitalization as well. Marcus Banks is a freelance writer.